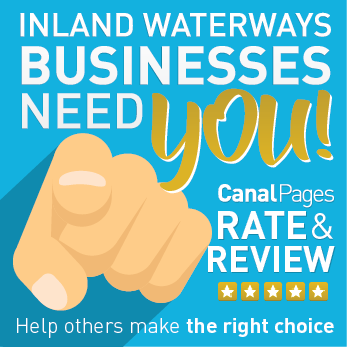 Leave a review for any business listed on Canal Pages! We want to provide a way for canal business users to share their experiences with each other. If you’ve got a (free) registered account, you can leave a review on a business’s page, based on your experience of having used this business. We welcome reviews written in a balanced, informative and constructive manner. Your review could be invaluable in helping to inform other boaters’ decisions about which businesses to approach! Give some idea of when and why you used a particular business. Try to focus on the specifics of your experience: whether your review is glowing with praise, takes a critical stance, or is fairly neutral in tone, please tell readers why you are saying what you are saying – for instance, what aspects did you like/dislike about the service or product you received; and what, to your mind, are the business’s particular strengths, etc.? Aim to keep your review fairly concise. The more detail it contains, the more helpful it is likely to be; but, at the same time, no-one is expecting an essay – and the more relevant and focussed a review is, the better! To leave a review: Find the business below, click ‘Write Review’ and then select your rating (out of 5 stars) and post your review. Simple! Please note that all reviews will be checked and approved before being published, and may be subject to editing when required. For more information, please see our FAQ.